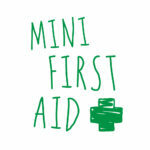 Mini First Aid offers first aid courses for all the family. The courses are delivered in a relaxed and comfortable style and cover the basics of life saving first aid, giving confidence to know what actions to take if faced with a medical emergency. Our 2 hour class for parents, grandparents and carers looks at what to do in a first aid emergency with your baby or child. Our classes cover first aid from birth up to puberty and we use a range of mannequins and choking vests to allow you to practice the appropriate techniques. The class covers; choking, CPR, bleeding, bumps, breaks, burns, febrile convulsions and meningitis awareness. You are also given a handy first aid information booklet to make notes in and take home. Our classes are very relaxed and if you have a pre-crawling baby they are very welcome to come with you. We run a regular class at The Little Gym in Harrogate and also offer private classes in your homes. Just get a minimum of 6 people together and we come to you to deliver the same class. Just 2 hours and £20 per person to learn valuable life saving skills. Our next Harrogate class is Monday 5th February 2018 at 10.30am at The Little Gym. Our class numbers are kept small so booking is essential.